Home NY Times Facing Big Brexit Votes, Theresa May Promises to Reopen Pact With E.U. LONDON — Facing a series of crucial votes in Parliament, Prime Minister Theresa May raised the stakes on Tuesday by promising to reopen Britain’s withdrawal agreement with the European Union, putting her on a direct collision course with the bloc. Mrs. May’s move came at a critical time, with Parliament voting Tuesday evening on a series of amendments to her Brexit plan, which earlier this month suffered one of the greatest defeats in modern British history. Before the night is out, Parliament could reverse decades of protocol and practice and assert control over policymaking that has been dominated by the governing party and its prime minister. Mrs. May told Parliament that she would seek “significant and legally binding” changes in the 585-page text, painstakingly negotiated over more than two years, to secure changes in the so-called Irish backstop plan that aims to ensure that goods cross the Irish frontier without any customs checks. In doing so, Mrs. May yielded to the demands of Brexit hard-liners in her Conservative Party who hate the Irish backstop plan, which they fear will tie Britain to the bloc’s trade rules indefinitely. In effect, she is gambling that the only hope of saving her plan for Brexit is to ask the European Union for something that it has always said was impossible. Mrs. May acknowledged that there would be “a limited appetite among our European partners” for her new plan. European Union officials have repeatedly made clear that there is no prospect of reopening the withdrawal agreement, and that at most they can offer only clarifications to reassure British lawmakers that the backstop will eventually disappear. Perhaps the most critical proposal being debated by Parliament on Tuesday, the Cooper-Boles amendment, would effectively rule out a “no-deal” Brexit if Mrs. May cannot persuade lawmakers to approve her plan by the end of next month. The Labour Party has put its weight behind the measure, which Mrs. May fears would weaken her in negotiations with the European Union. Many lawmakers suspect that Mrs. May is simply trying to run down the clock before bringing back a version of her deal to Parliament, tweaked with only cosmetic changes, and presenting it as the only alternative to an economically damaging departure without any deal. The Cooper-Boles amendment is designed to head this off by giving Mrs. May until the end of February to negotiate in Brussels, revise her plan and win approval for it from lawmakers. If she fails, the amendment holds, she must then try to postpone Brexit for as much as nine months. Mrs. May would be required to request an extension of negotiations with the European Union under Article 50 of the bloc’s treaty — something that all member governments would need to approve. The amendment, drafted by Nick Boles, a Conservative lawmaker, and Yvette Cooper, from Labour, is important not just in its substance but also how it overturns years of protocol by giving Parliament the power to legislate to stop a disorderly, possibly chaotic, British exit. 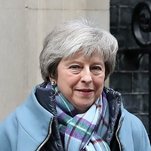 Mrs. May criticized the amendment, saying that it did not resolve the fundamental questions over Brexit and that “the choices will not go away if we postpone exit day.” In any event, she added, lawmakers would have another chance to stop a no-deal Brexit in a vote scheduled for the middle of next month. Analysts believe that the vote will be close: Some lawmakers from the opposition Labour Party are likely to reject the measure, because they fear it might anger Brexit-supporting voters whose support they need, particularly in the English North and Midlands. Mrs. May thinks that a show of support for this approach in Parliament would help convince the European Union to change its longstanding position and agree to a compromise. But hard-line Brexit supporters in her own party have objected to what they characterize as fuzzy language in the amendment, which they felt offered little or no guarantee of a definite end to the backstop. With the Brady amendment facing possible defeat unless those lawmakers back it, Mrs. May apparently felt she had no choice but to call for renegotiating the withdrawal agreement, something that will complicate negotiations with Brussels. Pro-Brexit Conservative lawmakers were seeking to push another plan that would give Britain more time to manage an exit without any agreement, referred to as the “Malthouse compromise” after another Conservative lawmaker, Kit Malthouse. There were severe doubts, however, that the European Union would contemplate such a proposal.